As I've shared before :-), my book which was published earlier this year is a collection of poetry. It tells the story of my spiritual awakening. I share the journey to discovering my truth in a single life-changing moment. Most areas of our lives require us to plan in order to reach a certain goal. We have to carefully and skillfully map out the path we need to take to reach a certain destination. However, that is not the case with an awakening. It’s unexpected. It’s unplanned. You don’t realize that you’ve been on a journey until you experience (say it with me) the spiritual awakening. Although, I don't feel every one every second of every day, I can say the "symptoms" above are correct. In that moment of truth, everything made sense. Every joy, pain, hurt, obstacle, success, failure, love, loss, betrayal, friendship, enemy etc. etc. all of a sudden had its perfect place in helping me develop into who I am. It’s true for you also. If you've had your moment of clarity, I would be honored if you could share a little. Just share what feels comfortable to you. For those who haven't yet, just wait! :-) You'll be telling your wonderful story one day. 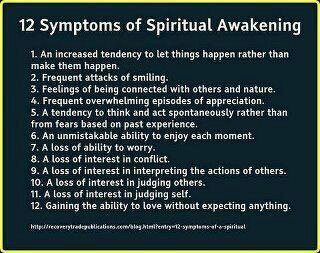 When my friend posted the list on Facebook, I immediately thought if someone asked me how do I know I was awakened, these twelve statements would be a huge part of the answer.